The Wall Street Journal pointed out yesterday that growth stocks in the US are outperforming value stocks by the widest margin since the late 1990s. Through November 27th the iShares Russell 1000 Growth ETF has gained +27.9% compared to just +8.7% for the iShares Russell 1000 Value ETF, a difference of almost 20% in favor of the most glamorous growth stocks. But we’ve seen this before. 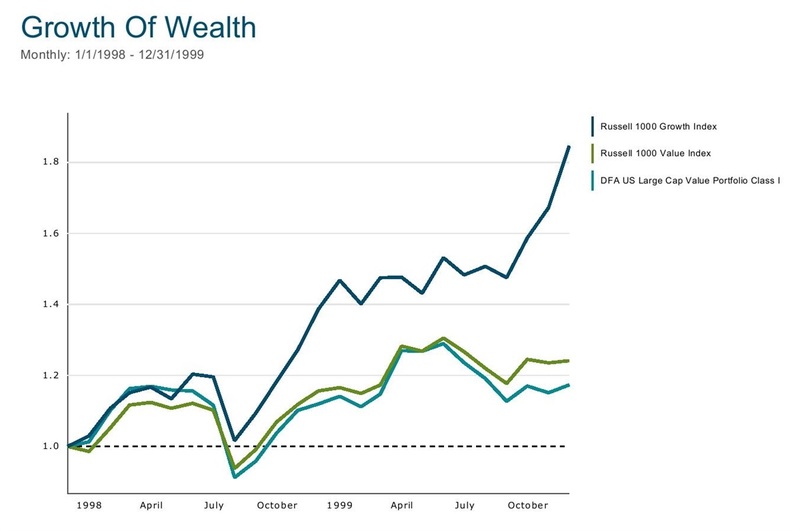 The chart below looks at the two-year cumulative returns beginning in 1998 for the Russell 1000 Growth and Russell 1000 Value Indexes along with the DFA US Large Value Fund — an “asset class” mutual fund designed to more consistently target the deepest and most profitable segment of the large-cap value stock universe. It wasn’t pretty for value. Growth stocks surged over +84% in just 24 months, averaging +35.9% per year. 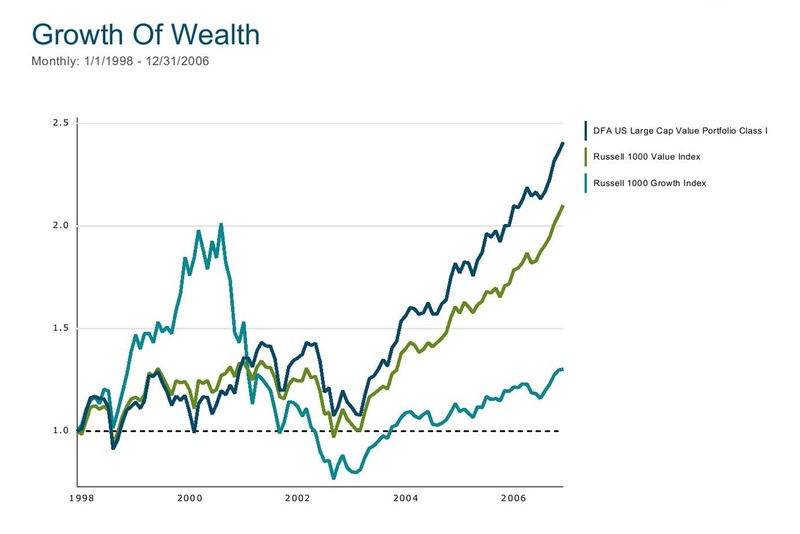 The Russell value index did OK — it was up 24.2%, or +11.4% per year. But this paled in comparison to high-flying growth stocks. The DFA US Large Value Fund, due to its sharper focus on value companies, trailed the watered-down value index, returning only +17.3%, or +8.3% per year. When the bloom came off of growth stocks, relative returns were equally dramatic. 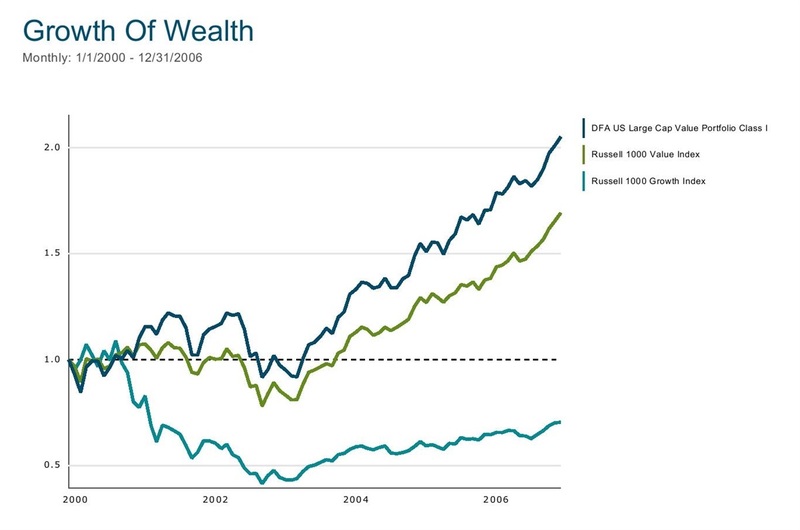 From 2000 through 2006, value stocks outperformed growth stocks every single year. It wasn’t just comparative outperformance that favored value; growth stocks actually lost money cumulatively for seven years. The chart below tells the tale. The Russell 1000 Growth Index was down 29.5%, losing -4.9% per year. The Russell 1000 Value Index gained +69.2% or +7.8% per year. The uber value-focused DFA US Large Value Fund did even better, gaining +105.1%, or +10.8% per year, better than its 1998-1999 performance. To the casual reader, this might simply appear like random cycles where sometimes growth wins and other times value wins but they come out about the same. That's not the case. The 1998-1999 period was the most extreme in favor of growth stocks in almost a century. But even starting the comparison in 1998, and following it through to 2006, finds that the net effect of the total cycle dramatically favors value stocks. The final chart below shows the entire period. The growth index managed only +36.2% cumulatively over this nine-year period or just 3% per year. The value index did far better despite its slow start—the Russell 1000 Value Index returned 110% or +8.6% per year. Finally, DFA’s deep value strategy trounced both indexes: it returned +140.7% or +10.3% per year. 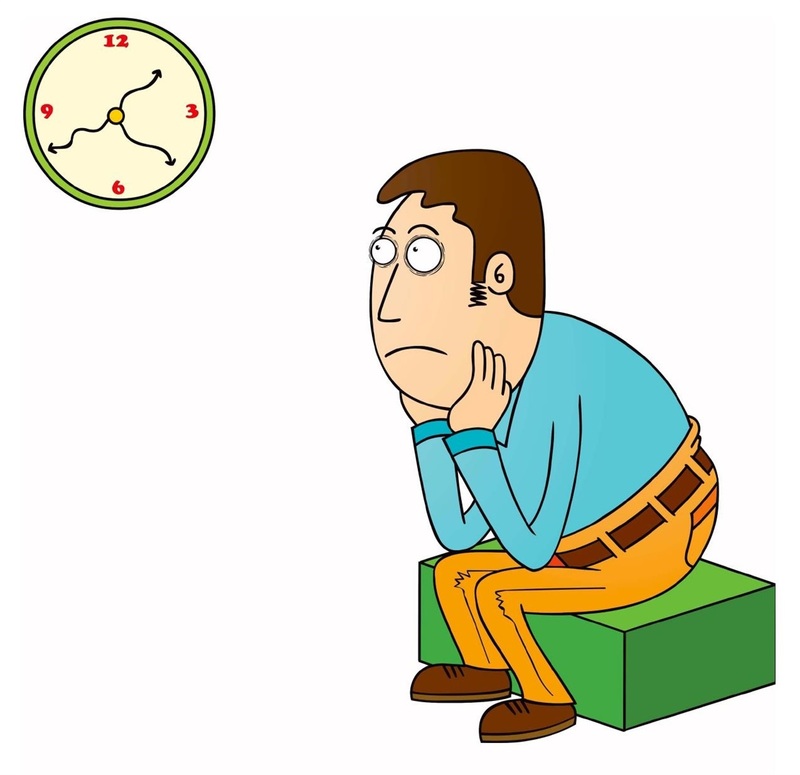 What are the lessons we can apply to today’s markets? Value investors who were able to stick with their strategy, who stayed patient despite the constant drumbeat of a "New Era" and the irrelevance of historical market data, were handsomely rewarded. Those value investors who opted for the more consistent and targeted DFA US Large Value Fund compared to a plain-vanilla value index fund were rewarded even further. Will it be different this time? It’s doubtful.